I have used wordless books in my English as a Second Language classes many times, because they so naturally promote oral language development. The same principle applies for our petites who are learning new words, learning how to engage with stories and talk about the books that they are reading. With so many reasons why wordless books are so valuable to our young readers lets talk about the books. There are so many incredible books to choose from, some have been around for a while and others are newer. I try not to rank books that are my favorite, because each one has something special about it or I wouldn’t take the time to share it with you. However, one of the books was so incredibly stunning that I couldn’t wait for my petite to get home from school to share it with her. Draw! by Raul Colon is so incredibly stunning, the illustrations are simply amazing. A little boy draws images of African animals and becomes part of the adventure. This book is perfect for all ages, and each age range I suspect will take something different away. Flashlight by Lizi Boyd. I was intrigued by this book because it gives such a unique perspective about the dark. I love this book and think that is has such neat features, little cut outs in the pages and beautiful illustrations. Journey by Aaron Becker is a stunning book that depicts what happens when a little girl who is bored draws a door on her bedroom wall and takes off on an incredible adventure. This is one of my petites favorite books. Quest by Aaron Becker is the story of two children who are given a map by a king who is then taken away and the kids are on a quest to rescue him. It is simply gorgeous. 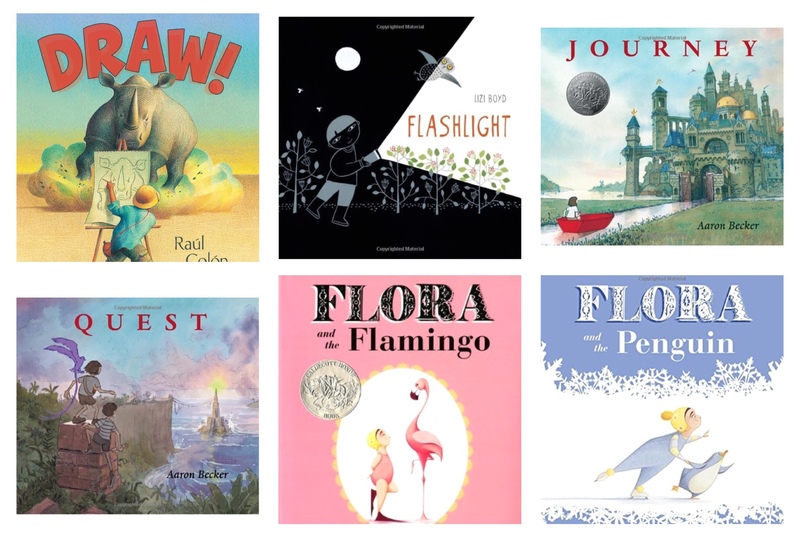 Flora and the Flamingo by Molly Idle is an amazing story with flaps you can lift illustrating a little girl and her flamingo friend who do a very special dance – it is completely charming. A very relatable story where petites can learn all about friendship. Flora and the Penguin by Molly Idle is the next step for our darling protagonist – since she has now mastered her ballet skills she moves onto ice skating with her penguin friend. This is a story about friends navigating what friendship means. A lovely story where your petites can sort through the ups and downs of friendship. Chalk by Bill Thomson is a really fun story for petites about a group of friends who find a bag of chalk at the park. As they draw with the chalk their images come alive. Luckily a rainstorm comes just in time. More suited for children a little bit older perhaps in the 7 and up range. Wave by Suzy Lee is an incredibly beautiful story using just two colors of water color. It is all about a little girl at the beach and her interactions with the waves, a great platform to discuss feelings and predictions. Flotsam by David Wiesner a young boy goes to the beach ready to examine all of the things that float onto the shore, he is surprised to find a camera and all that it has to show him. Tuesday by David Wiesner is a whimsical story of a Tuesday when frogs take to the air on their lily pads. This is a phenominal book that has been in print since 1991 and has sold half a million copies – for good reason it is so much fun to read and discuss. 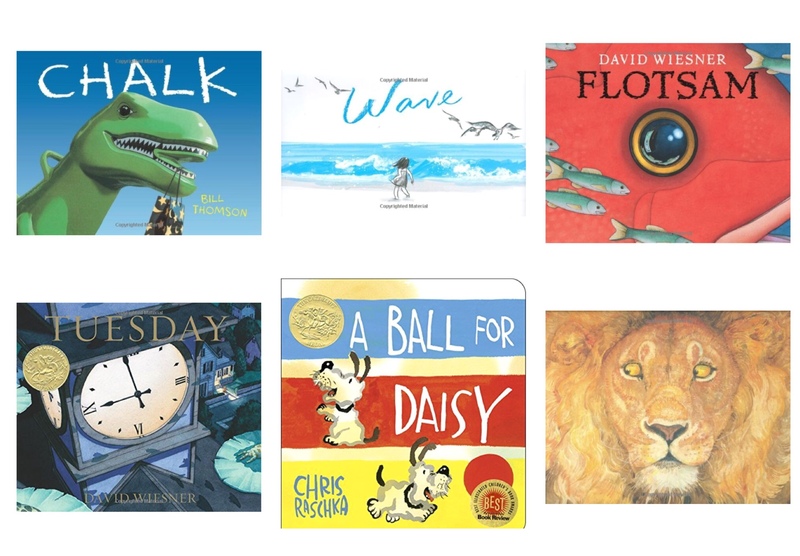 A Ball for Daisy by Chris Raschka is a fantastic story about a dog who looses her favorite ball to another dog, a highly relatable story for petites who have lost or broken a toy before. The Lion and the Mouse by Jerry Pinkney based on Aesop’s fables, two unlikely friends come together and help each other through some difficult situations. The illustrations are breathtaking. These books are all wonderful. With this list, I am sure you will be able to find a perfect story for you and your petites to enjoy. Seeing as we’re not out of the house yet, our favorite place to read with Emma is in her nursery. We have a great chair from Ikea that my dad turned into a glider for us where we read every night before we head to bed. It’s a great bedtime routine and way to get some quiet time as a family before bed. favorite place to read?! anywhere! we could be playing and he sees his books grabs one brings it over and we plop right down to read! then of course he runs off and continues on his little adventures! i do prefer the outdoors tho! cant wait for spring! so right now ill settle for the corner of the couch w my blanket!! We read in bed (or on the floor in front of the bookshelf) before going to sleep and after waking up… and whenever the urge strikes throughout the day. I read with Ava on the floor of her room or in bed before bedtime. She sits on my lap supported by the crook of my elbow. This way she can see the pages and my face as I read to her. She likes it when I make the animal sounds. Lately, our favorite place to read is cuddled on the floor of C’s room. However, we also like the chair in there. Bests place to read is snuggled on one of my boys beds at bedtime. It’s cozy and they’re in the perfect mood to relaxe and enjoy a good book.